Low-income homeowners face financial and social constraints that are serious challenges to providing adequate maintenance. The fact of owning a property should lead to material progress, security and income opportunities to cope with poverty, however these benefits depend on the capacity of homeowners to keep the property in good condition, and also on the opportunities and support generated by the context and the institutions involved. If these conditions are not guaranteed, low income households are at risk of experiencing unsuccessful ownership processes that may perpetuate poverty conditions. In the case of multi-owned buildings, also known as condominiums, the tension between individual and collective needs also affects maintenance, and entails additional challenges in terms of organisation, social relations and the use of common property areas. In Chile, subsidies and credit facilities, combined with the massive construction of low-cost housing, enabled low income groups to access homeownership, and social condominiums are a significant part of the affordable owner-occupied housing stock, however after decades of occupancy, this housing stock shows signs of deterioration and devaluation due to neglected maintenance. This situation is the result of a multi-causal problem involving the construction and architectural deficiencies of the dwellings provided, the financial and social constraints of the owners, problems of coexistence and cultural differences between residents of different backgrounds, and deteriorated internal organisations. The challenge of condominium maintenance in Chile is twofold. On the one hand, it includes the financial and social restrictions faced by homeowners that decrease their collective capacity to take care of building maintenance. On the other hand, it includes institutional limitations with regard to housing and condominium management in terms of regulations, institutions, and actors. Given the weak governmental support for maintenance practices and post-occupation process, third sector organisations are positioning themselves as alternatives that provide technical solutions and contribute to improving opportunities among deprived communities. This thesis explores the role of Chilean third sector organisations as part of the solution to support homeowners in condominium improvement and management. The following research question is asked: what are effective and feasible strategies for third sector organisations to support Chilean low income homeowners in the management of social condominiums?. In order to answer the main question, key questions are organised into three main parts: conceptualisation, analysis and proposal. The general research design is based on case study analysis in order to expand the type and range of solutions, given the limited experience of the Chilean third sector in condominium management activities. The first part, conceptualisation, presents the societal problem of low income homeownership through the lenses of condominium management and the specific situation of social condominiums in Santiago, Chile. The main findings are the identification of condominium management dimensions and interrelated challenges according to technical, organisational and sociocultural dimensions. Sociocultural problems related to knowledge, the culture of maintenance, trust and individualism were identified as important triggers for organisational and technical problems. The section ends with the development of an analytical framework to describe and evaluate interventions by third sector organisations in condominiums. The core of the framework is the intermediation that comprises the activities and the process developed by the organisation to improve management dimensions, and it is described through three overlapping roles: implementers, catalysts and partners. The framework also includes the concept of institutionalisation, which describes the relationship between the organisation and the institutional framework. The second part, analysis, comprises the case study analysis of third sector organisations in housing management through one local case (Proyecto Propio, Chile) and two international cases (VVE-010, The Netherlands and SDV, Spain). 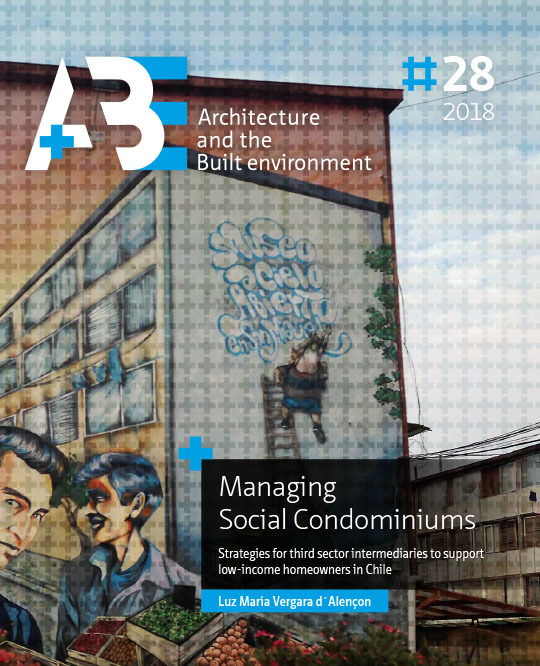 The Chilean case study focuses on the improvement of deteriorated social condominiums in Santiago, and aims to identify the possibilities and limitations of a local practice. The case of VVE-010 explores the technical and organisational dimensions of condominium management and the role of the municipality in the maintenance of owner-occupied housing stock. The case of SDV explores the sociocultural and organisational dimensions of housing management and the role of civil society organisations in the management of their own neighbourhoods. Given that the practices respond to a particular context and specific community needs, this research follows a systematic process of lesson-drawing to ensure the adequate implementation of the learnings according to the characteristics of the Chilean context. The selection of, and priorities for, the application of the strategies were defined by two main variables related to the context, and to the organisation that carries them out, represented in two matrices that define the typologies of the initial situations and management approaches. The typology of the initial situation describes the problems in condominiums according to the management conditions, and municipal capacity in relation to condominium management. The typology of the management approach is defined by the combination of roles and the scope of the intervention, representing overlapping and complementary ways to intermediate in social condominiums. The strategies and the typologies were discussed with third sector organisations and municipalities in a validation process which evaluated the adequacy and relevance of the typologies, and the feasibility and effectiveness of the strategies. Whilst the initial situations are relevant to identify potential barriers and enablers for the intermediation (in relation to municipal capacity) and to prioritise the strategies (in relation to management conditions), the management approaches are relevant to expanding the potential of third sector participation in Chile by promoting specialisation according to the challenges identified. Feasible and effective strategies with which third sector organisations can support low income homeowners in the management of social condominiums are multi-dimensional, so as to tackle the interrelated challenges. They are developed from the capacity of the third sector organisation as intermediary, meaning that they respond to catalyst and implementer roles to address management challenges at the condominium level by contributing to increase the community’s capacities and level the built environment conditions. Given the social complexities of deprived neighbourhoods, integral interventions, but also trained organisations, are required. The partner role is therefore included to foster the specialisation of third sector organisations and collaboration between local public and private organisations. Overall, the dissertation addresses the maintenance problem from the external action of third sector intermediaries in order to catalyse better management practices. The strategies altogether seek to achieve autonomous condominiums in which homeowners have the tools and the capacities to maintain an internal organisation, and have access to the professional services that allow them to provide adequate maintenance in the long-term, and manage the existing but limited resources efficiently. The dissertation contributes to filling knowledge gaps regarding the concept of housing management in the Latin American context. It also proposes a problem-solving perspective by introducing the role of third sector intermediaries as one of the solutions, exploring different approaches and respective strategies to intermediate in the field of condominium management. The main limitations of the study are related to the specific applicability of the strategies to the Chilean context, but further developments are related to action research exploration, and an evaluation of the capacity of civil society organisations such as neighbourhood associations in the management of their own neighbourhoods.